After planting and coaxing along eggplant plants all summer, from the appearance of blossoms to the formation of the vegetables, many gardeners anticipate the eggplant harvest with great eagerness. 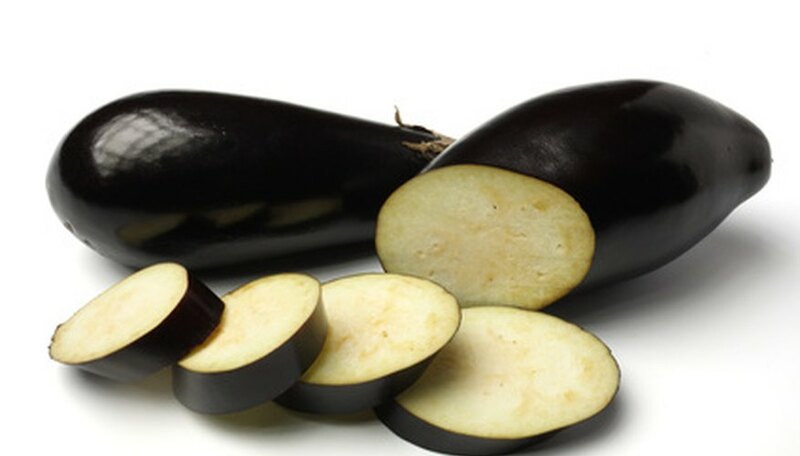 The mature size of an eggplant varies with the variety; however, other indications of maturity will generally be the same for all eggplant varieties. When the time comes to pick eggplants, head out to the garden with a basket large enough to gather your harvest and bring it into the kitchen. Examine the eggplants to determine maturity. Lift the eggplant in your hand. If the eggplant feels heavy in your hand, this indicates maturity. If the eggplant looks shiny and the skin feels firm, the eggplant is ready to pick. Hold the eggplant in one hand to ensure it does not fall to the ground while you pick it. Clip the eggplant stem approximately 2 inches above the eggplant with the garden shears. Place the eggplant into your basket, and repeat the process to pick every ripe eggplant. Wear gardening gloves as you pick eggplants because eggplant stems have sharp thorns. Picking eggplants while they are smaller rather than larger will help encourage an eggplant plant to continue producing more eggplants. Store freshly picked eggplants at temperatures between 50 F and 55 F for up to one week. Refrigerating an eggplant will reduce quality and taste. Never attempt to pull or twist an eggplant from the plant. Due to the thickness of the eggplant stems, you will likely damage the plant by harvesting eggplants in this way.